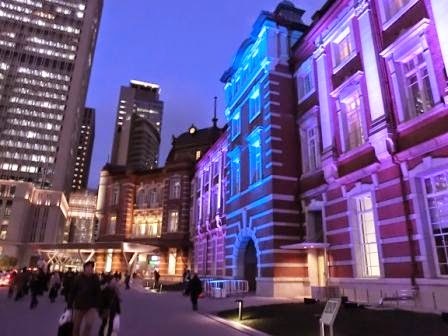 I’ve uploaded Yebisu Garden Place Illuminations 2014 and its Baccarat chandelier, and today I’d like to share Christmas lights at Tokyo Station, the very central station of Tokyo, which just started. 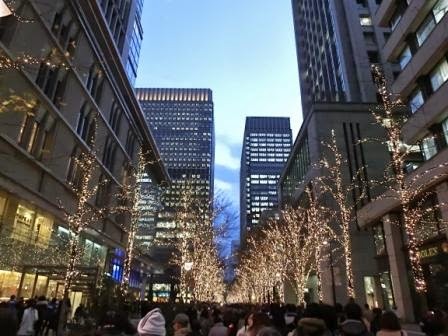 This event is named, “Tokyo Michi-Terrace/Terasu.” (Please go down this post for the schedule and place.) “Michi” means “way” and “street.” The Japanese verb, “terasu” is “light up,” and the pronunciation is similar to “terrace” in English. It’s a bit complicated to explain it, but it’s a very cool naming. You have something to see while you are waiting for the evening. 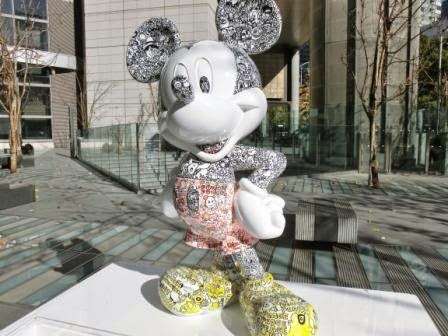 Disney characters’ objets d’art are part of this event and 12 objets are in Marunouchi area from Tokyo Station to neighboring Yurakucho Station. 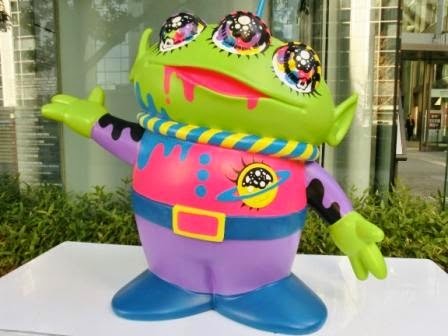 They are decorated by Japanese artists. I’ll show you some of them. 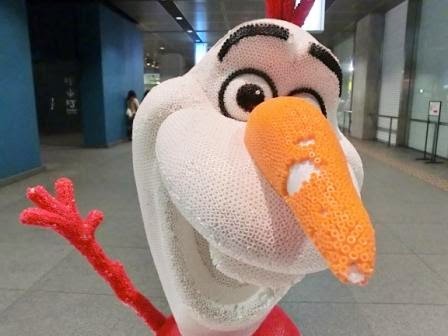 Olaf of beads. Frozen the Disney movie jumped into Rank 3 of Profit of Films in Japan so far – it was such a hit this year. Frozen was my first Disney movie. I was just stunned by the cultural differences between Disney Films and me in the movie theater. For me, Disney is Disney land, something to explore the atmosphere. Not a film, not a story. But anyway, Olaf is a nice guy. Nice snowman. If you are a big Disney fan who want to meet all of the 12, the Map is here. 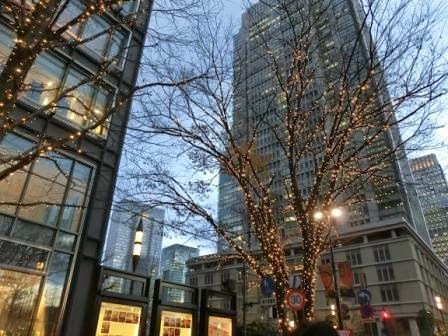 When it becomes evening, the trees with lights in streets and some LED light displays attract visitors. 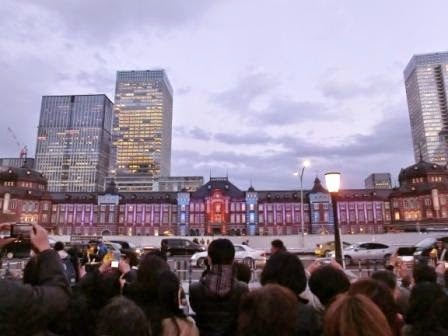 Tokyo Station just celebrated its 100 Years Anniversary. The brick architect was originally built in Taisho era, early 20th century, around 100 years ago. It has gone through some renovations, but the retro designs inspired from Europe at that time were preserved as a historic building. I can’t say that it was not crowded. Event staff members and some police officers were guiding people to avoid confusion. Sky blue and lavender were popular colors in Taisho era, when Japanese modern cultures and democracy bloomed. 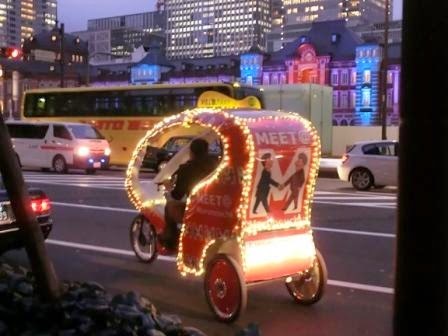 It is called Taisho Roman, and Tokyo Michi-Terasu 2014 features those colors for some respect. 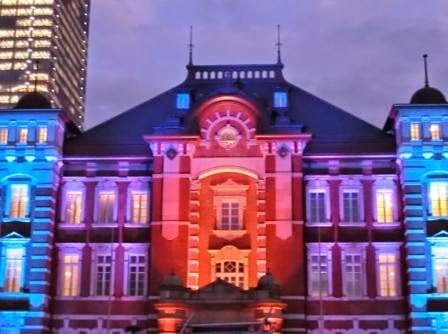 Tokyo Station Hotel is part of this building. 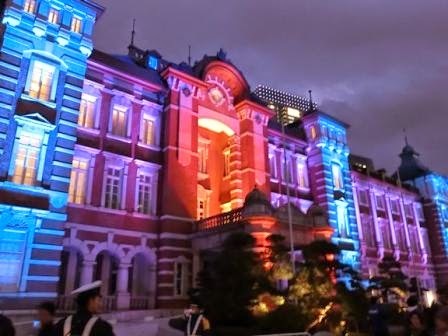 Tokyo Station Hotel with lights! But this Christmas light event was successful. Although I suppose they can develop more, I was able to explore the artistic illuminations. Romantic, retro and unique lighting welcomes you until 28 December. 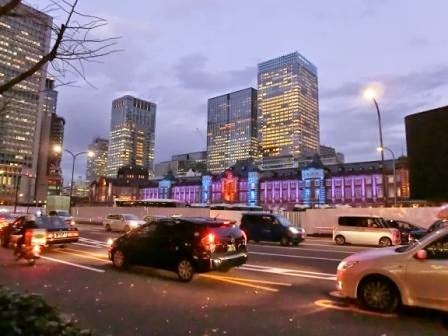 Hotels near Tokyo Station – It’s easy to visit Tokyo Station from anywhere in Tokyo, but if you hope to stay there, you find fabulous hotels including Shangri-La Hotel Tokyo, Four Seasons Hotel Tokyo at Marunouchi and retro & modern The Tokyo Station Hotel. Imperial Palace is close, too. Wow! 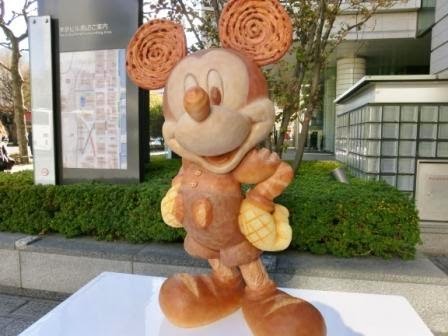 There's so much to see and do there – LOVE the decorated figures, especially Mickey!! Have a wonderful New Year, and we will catch up online again in 2015!! Thanks, Red! I'm looking forward to seeing Amazing Australian Adventures again in 2015. And I wish a Big Year for myself. Have a wonderful New Year to you, too!